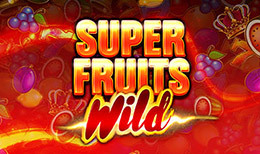 If you’re the kind of player who loves some fruity fun, then Super Fruits Wild by Inspired Gaming is the slot for you. It’s a 5-reel 10 fixed line slot. Fortunately, or unfortunately, depending on what type of punter you are, this slot lacks bonus features like pick ‘em games, free spins or progressive jackpots. Instead this slot has a few simple bonus features like Hot Spins, Fortune Spins, replicating and expanding wilds, and more. Read about all of them below. Inspired Gaming Group is a leading server-based gaming (SBG) supplier. Inspired Gaming has more than 50,000 gaming machines tabulating bets in 30 countries all over the world. It’s a UK based company that’s managed to expand its 15-year history and have offices all over continental Europe and the British Isles. The company has employed over 10,000 staff. Inspired tends to direct their focus toward land-based gambling solutions in bingo halls, arcade rooms and betting shops. The slot animations run pretty smoothly with electronic sound effects echoing out each time you press the spin button. The reels will shake violently every time a big win is formed and the winning symbols will light up in flames. The fruit symbols in Super Fruits Wild represent the 6 least valuable symbols. These include; oranges, plums, lemons and cherries. Lining up each of those rewards up to 10x your bet, while grapes and watermelons reward up to 20x your bet. Other game symbols include the liberty bell, 7’s, jewels, the Super Fruits Wild logo and more. Liberty bells reward up to 25x your bet. Lining up sets of lucky blue 7s reward 30x your bet, but the fiery ones win you 40x your bet. However, you’ll want to aim for the jewel-encrusted jewels as these can win you a 250x your bet win. The Super Fruits Wild logo represents an expanding wild symbol which typically lands on the 2nd, 3rd and 4th reels. Hot Spins- It isn’t always safe to gamble your win, but if you’re willing to take the risk then you can opt for the Hot Spins. 4 reel sets appear and you will need to spin on 1 at a time with the total bet split across them. Expanding wilds will move across to subsequent reels each time they land so it’ll be extra lucky if you can get them on the 1st If you don’t want to risk gambling your entire win, you can settle for placing a higher bet. Click on the Fortune Spins button to get started. It’s tough to rate slots because some gamblers want their slots looking more modern and containing a lot of innovative features, while others prepare keeping it at the bare minimum. Which one are you? This slot falls in the bare minimum category. Super Fruits Wild has a little mix of both- classic aspects like fruit symbols and modern aspects like expanding wilds. This slot has a medium volatility and RTP % of 94.98%.